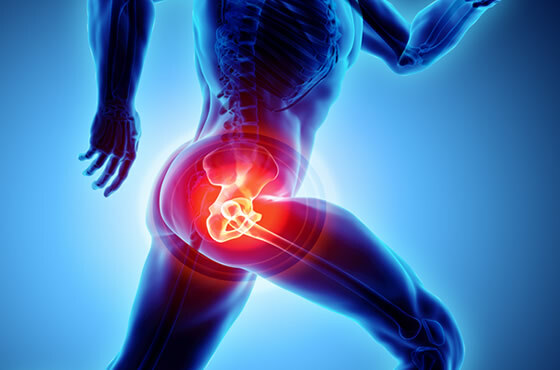 Of all the joints in the body, the hip joints are the largest and handle a heavy load. Any injury or deterioration of this ball and socket joint can limit weight-bearing mobility, range of motion and performance, and may also cause intense pain. Dr. Kerisimasi Reynolds specializes in orthopedic treatments to restore function to disabled hip joints at his practice in the San Jose area. The hip joint contains the femur (thigh bone), pelvis (three different bones), muscles, tendons, ligaments, nerves and blood vessels. The femoral head, the “ball,” and the acetabulum, the “socket,” create the hip ball and socket joint. When the hip joint is working correctly, it allows various movements, including flexion, extension, abduction, adduction, circumduction and rotation. When an injury or deterioration occur to any of the components, it can greatly limit mobility and become very painful. Orthopedic surgery or treatment may be needed to repair or replace components to restore full mobility for the patient. If you are suffering from any of these hip conditions or injuries, contact Dr. Reynolds’ team and schedule a consultation. He has vast experience in minimally-invasive orthopedic treatments and arthroplasty for hip, elbow, shoulder and knee joints, using cutting-edge methods for outstanding results. Contact our office today – we accept many different forms of insurance and PPO plans at our practice.